Memory management for AI and GS is bad, everything comes out of the runtime library's default heap, so a single script running loose can exhaust all memory available to the OpenTTD process and cause a hard crash of the game. This PR extends Squirrel to support custom a custom allocator (which has to be "context switched" manually), and so far uses it to keep track of allocation size for each running script. The end goal of this PR is to implement an arena allocator that will allow putting hard limits on how much memory a single script can use. Inspired by report in #7513 but it turns out the problem there may not be related to OoM conditions. What should the default memory limit be? Right now it's 128 MB and that may not be enough for common use. 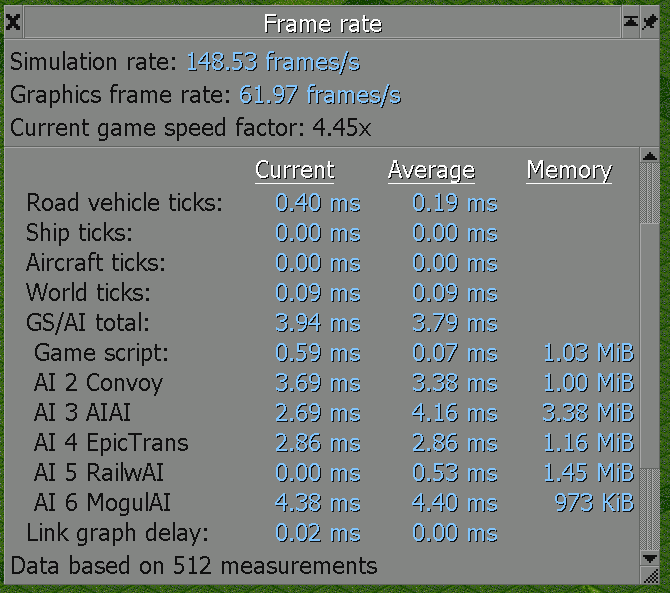 How much of a problem is it that the Memory column in the frame rate window shows even when there are no active scripts? As for the memory limit, I think that this memory limit should default depending on your system's RAM. I also propose that the RAM limit for AI/GS be configurable (both total and per-script, hidden from Advanced Settings), accepting k/K, m/M, g/G for 1024 (1 KiB), 1048576 (1 MiB), and 1073741824 (1 GiB) respectively. The reason for that is that some people may have computers with 16GB RAM plus, and want to have their AI/GS be able to utilize more of that, while other computers may only have 512 MB to 1 GB RAM and/or don't want their AI/GS taking up a lot of RAM to prevent out-of-memory errors. Good luck finding a reliable cross-platform way to determine amount of system RAM, let alone free RAM. I think this might actually be dangerous, since not all call sites for CallMethod will catch the exception thrown. It might be possible to write a script that exceeds memory in the settings function or similar and causes a hard crash. Not sure what the best way to handle that is. This can avoid out-of-memory situations due to single scripts using up the entire address space. Instead, scripts that go above the maximum are killed. The maximum is default 1 GB per script, but can be configured by a setting.